In July, roughly 1,000 rural Sonoma County residents overflowed classrooms and small meeting chambers at five informational sessions convened by the State Water Resources Control Board. It would be hard to exaggerate many attendees' outrage. At one meeting, two men got in a fistfight over whether to be "respectful" to the state and federal officials on hand. The immediate source of their frustration is a drought-related "emergency order" in portions of four Russian River tributaries: Mill Creek, Mark West Creek, Green Valley Creek and Dutch Bill Creek. Its stated aim is to protect endangered coho salmon and threatened steelhead trout. Among other things, the 270-day regulation forbids the watering of lawns. It places limits on car washing and watering residential gardens. It does not, however, restrict water use of the main contemporary cause of these watersheds' decline: the wine industry. "The State Water Resources Control Board is regulating lawns? I challenge you to find ornamental lawns in the Dutch Bill, Green Valley and Atascadero Creek watersheds," said Occidental resident Ann Maurice in a statement to the water board, summing up many residents' sentiments. "It is not grass that is causing the problem. It is irrigated vineyards." Sonoma County Supervisor James Gore, whose district encompasses more Russian River stream miles than that of any other county supervisor, has been strongly involved in developing the county's response to the water board regulations and was the only supervisor to attend any of the state's so-called community meetings. "I applaud the winegrowers for stepping up," Gore says in an interview. "I think they saw the writing on the wall. They knew they weren't going to continue to be exempt from this sort of regulation for long, and there are also winegrowers already doing good things in those watersheds who wanted to tell their stories." Initially, state and federal officials who crafted the regulation said they preferred cutting off "superfluous" uses as a first step. "Our target is not irrigation that provides an economic benefit," says State Water Resources Control Board member Dorene D'Adamo of Stanislaus. D'Adamo has been the five-member board's point person for developing the regulations and was appointed by Gov. Jerry Brown as its "agricultural representative." Many residents argue that there is no way of monitoring the vineyards' compliance with the voluntary cutback because their water use has never been metered. Moreover, these residents' passionate response to the regulation did not emerge in a vacuum. Rather, it tapped a deep well of resentment regarding the long-standing preferential treatment they say state, county and even federal officials have accorded the powerful, multibillion dollar regional wine industry. As longtime Mark West Creek area resident Laura Waldbaum notes, her voice sharpening into an insistent tone, "The problem in Mark West Creek did not start with the drought." As California lurches through its fourth year of an unprecedented drought, it is no surprise that long-simmering Russian River water conflicts have come to the forefront. At the center of this struggle are salmon and trout, whose epic life journeys play out on a scale akin to Homer's Odysseus. 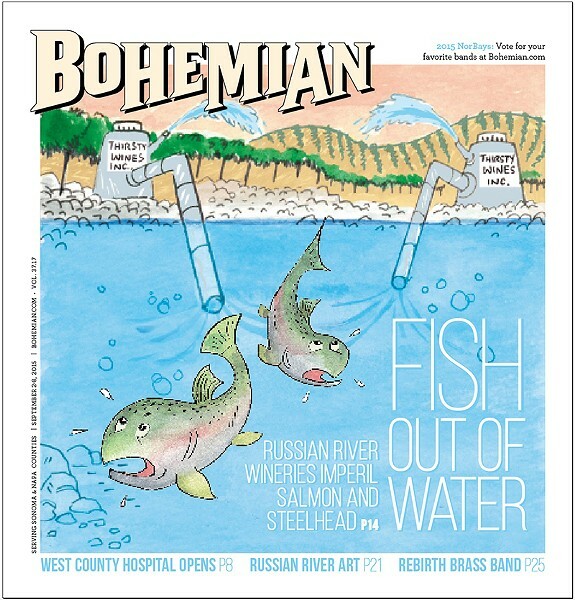 Historically, the Russian River has been known for its runs of three different salmonids: coho salmon (which are federally listed as "endangered"), Chinook salmon and steelhead trout (which are "threatened"). All three fish are born in local creeks, or in the river itself, migrate to the ocean as they near adulthood and finally return to their natal streams to spawn and die. As a growing body of scientific evidence indicates, salmon are crucial to the health of aquatic ecosystems, and their carcasses provide an enormous quantity of marine nutrients that can fertilize vegetation throughout a watershed. Much of the abundance of Pacific Northwest forests is traceable to the region's salmon runs. The mountains of Sonoma County are veined with streams that historically provided some of the Pacific Coast's finest steelhead and coho spawning grounds and rearing nurseries. But the four horsemen of fisheries collapse—habitat degradation, dams, weakening of the genetic pool through the use of hatcheries, and overfishing—have taken an enormous toll. The destruction of ancient forests, instream gravel mining, the construction of the Warm Spring and Coyote Valley dams, and widespread agricultural development along waterways are among the main culprits. Overall, says National Marine Fisheries Service (NMFS) biologist David Hines, the river has devolved into "a basket case." "Some of the coastal streams in Mendocino County and further north have stronger fish populations because, even with the history of overlogging, the land hasn't sustained as much damage," Hines says. "In the Russian and San Lorenzo rivers [in Santa Cruz County], especially, much more of the habitat is simply gone." According to Fred Euphrat, a Santa Rosa Junior College forestry instructor who holds a doctorate in watershed management, the wine industry's extraordinary expansion throughout the Russian River watershed in the last 40 years has been a major cause of the watershed's enormous trouble. "There's been massive habitat destruction, habitat fragmentation, alteration of land and drainage water that delivers sediment to streams," he notes. The vast majority of regional vineyards are irrigated. Many use water from wells, an unknown proportion of which are hydrologically connected to the river. Others pump water directly from streams, creeks and the river itself.